I recently read a post on the blog superhappyawesome in which they spoke about how the video for the Black Eyed Peas song Just Cant Get Enough that was filmed in Japan and may have elements taken from the film Lost in Translation. Well this got me thinking about all the videos that feature or are inspired by Japan and as I was listing them the videos just seemed to pile up. It seems todays music artists are queuing up to feature Japan or it’s pop culture in their videos. From Lady Ga Ga to Kanye West, there are not many modern pop artists that haven’t done the Japan thing. This says a lot about how Japan is perceived to the rest of the world. It’s modern, it’s cool and it’s fun. If you are trying to show your fans that you are the newest biggest thing then you cannot go wrong with including Japanese style in your video’s and why not? Japan not only brings us some of the latest fashion, technology and art but it’s music industry is one of the most sophisticated and cutting edge. 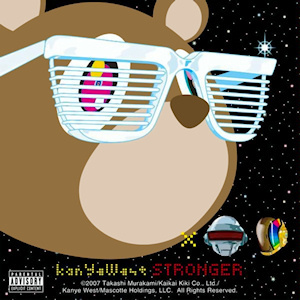 One of my favorite videos is Kanye Wests Stronger. Not only does this include an ultra modern Japan themed video but even the cover art of the single features artwork by Japanese artist Takashi Murakami. This video is full of shots of neo covered building and filmed on location in Harajuku clothing store Billionaire Boys Club/Ice and Aoyama-based clothing store A Bathing Ape, with constant flashing imagery of Japanese text. Including real motorbike gangs. The video also has a lot of scenes that pay homage to the 1988 anime film Akira. This trend in music and Japan continues to be ever more present in modern music and does not show any signs of going away. You can look back at earlier artists such as Gwen Stefani her music videos were covered in Japanese art and style, she even brought out a clothing range inspired by Japanese clothing, her backing dancer were the Harajuku Girls she could not have been anymore Japanese if she tried. The list seems to be endless of the videos or artists that use Japan for style and image and it looks set to continue and I for one cannot get enough of it. Posted by theloveofjapan on July 17, 2011 in Entertainment, Experiences, Fun, Music, Videos and tagged black eyed peas, culture, gwen stefani, japan, kanye west, music, music videos, postaweek2011. I myself didn’t even know that BEP song was filmed in Japan O__O It just looked like America to me. But I do love Gwen Stefani and the Harajuku girls.